Naturalism is a deterrent for some moviegoers. Mispronunciations, reeling improvisation and spontaneous laughter are mostly reserved for gag reels. Writer/director/sometimes actor Joe Swanberg (You’re Next, Happy Christmas), shining knight of the mumblecore movement, revels in these types of moments. One of the liveliest movie-related arguments I’ve engaged in recently concerned Swanberg’s Drinking Buddies and whether or not it was a waste of viewer’s time. The very things my friend found infuriating about the film (rambling narrative, plotlessness) I found invigorating. Gene Siskel was known to ask “Is this film more interesting than a documentary of the same actors having lunch?” Swanberg has accomplished the task of having his lunch and eating it too. Digging For Fire stars co-writer Jake Johnson (Safety Not Guaranteed, New Girl) as Tim, a new father and adoring husband to Lee (Rosemary DeWitt). Lee manages to land a house-sitting gig from an celebrity client. Early into their stay, Tim (while gardening?) discovers a human-looking bone and pistol buried near the house. Lee doesn’t share Tim’s enthusiasm surrounding the discovery and advises he quit digging. Soon after, she takes their son (played by Swanberg’s own) to her parents (Judith Light and Sam Elliott) in order to visit some friends (Melanie Lynskey, Ron Livingston). Tim uses the opportunity to invite friends over for a night of hard alcohol and hard drugs. As if the cast weren’t stacked enough, said friends are played by Anna Kendrick, Sam Rockwell, Chris Messina and Mike Birbiglia. Tim speaks excitedly of his morbid findings on the hillside, piquing the interest of Max (Brie Larson), a friend of a friend. Lee, meanwhile, finds herself alone at a bar after having been ditched by her buddies. A walking hiccup of a man painfully attempts to make a move on her until a handsome fella (Orlando Bloom, weirdly enough) intervenes and suffers a gash to the head. Heroism at its best. Tension builds as both Lee and Tim find themselves tempted to stray when left to their own devices. 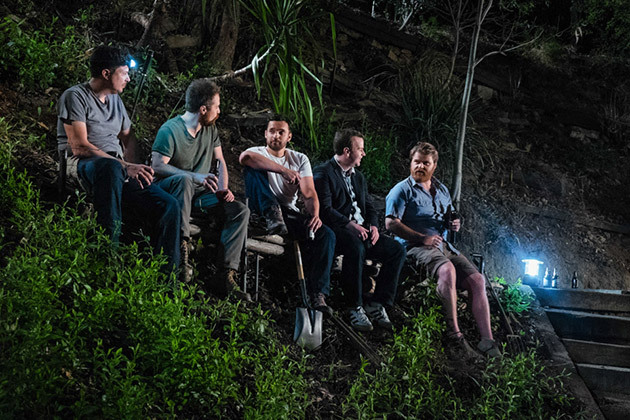 Max returns to the house to retrieve a forgotten purse and ends up spending the day with Tim, drinking and digging. Lee galavants around town with Ben (Bloom), visiting a friend (Kendrick again) and walking the beach. This leads to an ill-advised kiss, the result of which I won’t spoil except to say it surprised me. Digging For Fire is not without its problems. Despite the star-studded cast Swanberg impressively assembles, few are left with anything of note to say or do. I suppose it goes with the territory in this type of picture, but it makes it no less frustrating. That said, both Birbiglia and Rockwell are given additional scenes to flesh out their characters and come out best as a result. Also, the whole digging thing. Cute enough in concept, but the metaphor hits you over the head like a ton of metaphorical bricks. Tim digs for answers, only to bury them again when the truth he unearths scares him. I get it, You get it. We get it. I wouldn’t recommend this to just anybody. But I’ll recommend it to you.